We'll find out how the Mate 10 measures up on October 16. While people are excited about the impending releases of the iPhone 8, 8+, and X, Chinese smartphone maker Huawei is aiming to take away some of Apple’s spotlight with a smartphone reveal of their own. In a Facebook video posted on September 15, Huawei poked fun at Apple’s facial recognition technology: the video features a clown face that fails to be identified by the phone, leaving the phone locked. This could be referencing a moment during Apple’s Keynote, when a demonstration of the iPhone X’s Face ID feature didn’t work out as planned; though that was later explained by Yahoo to be a human error made beforehand. “Let’s face it, facial recognition isn’t for everyone. Unlock the future with #TheRealAIPhone. 16.10.2017,” reads the video’s description. Concept image of the Kirin 970. Image Credit: Huawei. 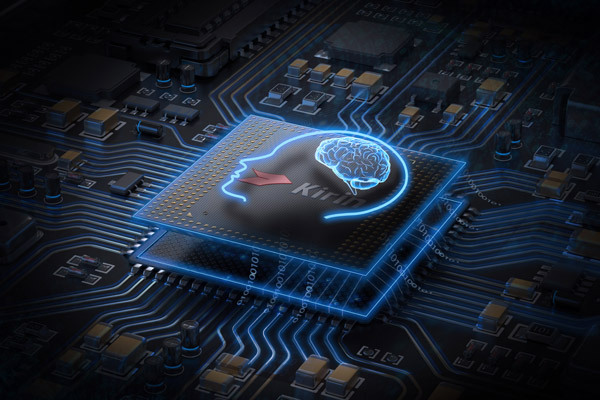 Apple’s A11 Bionic neural engine is meant to run tasks like Face ID, Animoji, and augmented reality apps, but Huawei’s claim suggests it intends to do more with the Kirin 970 — The Verge notes the Mate 9 machine learns to change the operating system’s behavior over time in response to a user’s habits. Huawei may be attempting to offer similar benefits with the Mate 10. Of course, it will be hard to tell what either of these phones can really do until they’re widely available and put to the test. If the Mate 10 and Kirin 970 do prove to be more powerful than anything Apple has to offer, however, it could widen the gap between the two companies, and solidify Huawei’s spot as the second largest smartphone brand.